Start by considering two things: what is really important about the site, i.e. what do I really want to know? and what methods will I use to analyse the results? The best monitoring schemes usually answer just one or two simple, easily measurable questions. E.g. Is the meadow more or less species-rich than before? Has the cover of Sphagnum increased on the bog? If you know what kind of statistical analysis you will do from the start, you are more likely to design a scheme that works and that tells you something useful. If you don't know any statistics you can still ensure that you get a sucessful scheme by following five key principles. 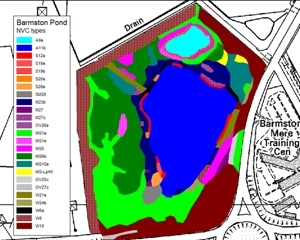 The amount of time needed to do a NVC survey depends mostly on the level of detail used in the mapping and the number of quadrats recorded. It is easy to do a 'cheap' job if you take a broad-brush approach to mapping and do few quadrats. However, this approach may not give you the information you need. If you ask several people to quote for a NVC survey job the only way of comparing value-for-money from the different quotes is to specify the level of detail you want. On most NVC surveys we take the following detailed approach. We normally map separate vegetation parcels down to 10m x 20m for important species-rich types, or to 25m x 25m for less interesting types. Important smaller stands are mapped with 10-figure grid references as target notes. On most sites we aim for at least 5 quadrats per vegetation type; or 10 for the most important vegetation types, or if the site is very large. John O’Reilly has over 25 years botanical experience and he is still learning! I do not believe that you can be a "leading expert" in vegetation survey without equivalent plant taxonomic skill (including bryophytes for NVC survey work) because accurate plant identification is fundamental to the validity of all vegetation surveys. We also believe that botanical surveyors should be trained vegetation scientists - able to use and interpret statistical analyses and apply phytosociological theory. Unusually, we use an evidence-based approach to our work which means that, for example, when giving management advice, we consult the latest scientific literature rather than just relying on local opinion and our field experience. We regularly conduct scientific literature reviews for clients to inform options for habitat restoration and site management plans. John is a professionally qualified ecologist who has studied vegetation from Orkney to the Isles of Scilly and many places in between. He is also a keen all-round amateur naturalist. We have a strong track record of working with government agencies, conservation NGOs and local authorities and are active members of the British Bryological Society and the Botanical Society of the British Isles. If you need a service that is not listed or would like more information please contact us to explore your requirements.